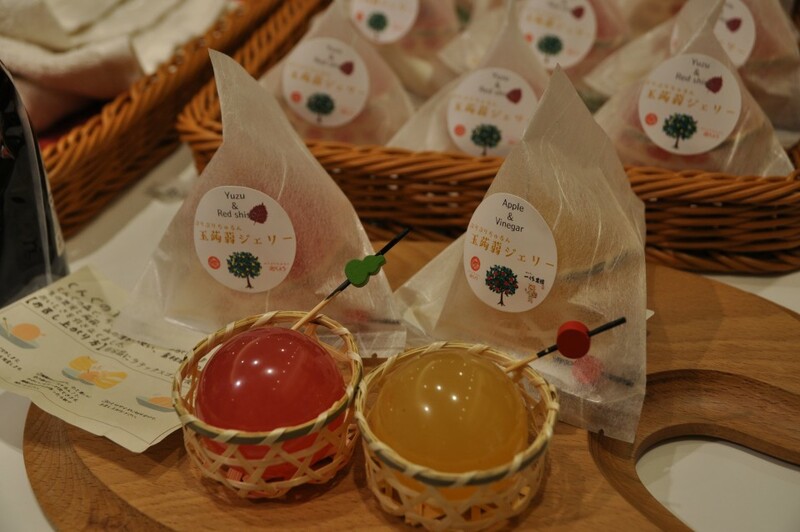 Haruna Endo never saw it coming, but after over 10 years of trial and error, she is finding success in selling her konnyaku jelly by using it to make eye-catching products to entice consumers from both Japan and abroad. "It was as if I was struck by lightning," said Endo, who calls herself a "hyper konnyaku creator," as she recalled the time she first ate konnyaku freshly prepared by her husband's uncle in Numata, Gunma Prefecture, northwest of Tokyo. "It was so soft and completely changed my image of konnyaku. I wanted to spread the news," said Endo, head of Kasho, a konnyaku-focused factory in Gunma Prefecture. The region is Japan's largest producer of the potato-like tuber stem plant -- also known as konjac, konjaku or konnyaku potato -- holding a market share of around 90 percent. Endo sells a wide variety of unique products mostly spiced up with "a spirit of fun," such as konnyaku bubble tea, or balloon-shaped konnyaku jelly deserts that come in various colors that are perfect as Instagram fodder. She is also playful in naming her products by using onomatopoeia such as "chururin" ("slurp") or "puri puri" ("boing") or by labeling them as "gifts from the tengu," a long-nosed creature found in Japanese legendary folklore. When a limited run of konnyaku bubble tea was introduced at a hotel in the popular Kusatsu hot spa resort in the prefecture in August, more than 1,700 drinks were sold in about a fortnight. Encouraged, Endo intends to sell them in other places next summer. Although ultimately a low-calorie food, konnyaku may give something of a shock to those not accustomed to its almost ghastly grayish white, rubber-like and gelatinous appearance. Indeed the food, derived from the corm of the plant, goes by nicknames such as "devil's tongue," "voodoo lily," "elephant yam" and "snake palm." It is said to have been introduced to Japan from Indochina around 1,500 years ago. The flavorless food, 98-percent made of water, often appears in Japanese dishes like oden, a soy-flavored hot pot broth with fishcakes, radish and boiled eggs, as well as in miso soup with pork and vegetables. Shirataki, which is konnyaku cut into noodle-like strips, are used in hot pot dishes as they absorb soup well. But demand for konnyaku has not been increasing as the domestic market has receded in recent years, prompting Endo to take her products overseas. She said products sold in United States, in New Jersey and Los Angeles specifically, were well received by locals, most of whom were tasting it for the first time. "It doesn't make sense to do the same thing that other konnyaku farmers do, so I wanted to be different and do something that can be attractive on the global stage," Endo said. "Luckily there is a boom for Japanese cuisine recently overseas. I hope more people will become familiar with konnyaku," she said. The path to success has not been easy for Endo, who has taken jobs such as a part-time dental clinic worker and English teacher in the past. But before konnyaku, she had never worked in the farming sector. In 2005, Endo moved to Numata, her husband's hometown, hoping to raise her child in an environment closer to nature. She got her opportunity to take a shot at producing konnyaku after an acquaintance of her father-in-law decided to quit farming. But when she actually started she found the konnyaku devil was in the details. "I had no skill and experience and the reality of farming was completely different from the image I had," Endo said. "I had read books on how to grow konjac, but it works completely different in reality. It's something where experience counts for everything." She said she was surprised how sensitive to weather and delicate konnyaku is. "My stomach ached due to stress whenever a typhoon was approaching. Growing konnyaku is like gambling, high-risk, high-return," said Endo. Unlike potatoes that can be harvested in a few months, konjac takes around three years to harvest. They are vulnerable to cold and rot easily. It was around a decade later that Endo finally acquired the skills to grow konnyaku. In August 2015, she inherited a manufacturing factory from her husband's uncle, giving her the chance to make the same konnyaku that had struck her like lightning. As a newcomer, finding customers did not come easy. "But if you have the will and courage even a small farmer like me can do it and even branch out to the world," Endo said, adding that her latest plan is to sell konnyaku bubble tea in Yangon, Myanmar. "It never feels like a chore because I am sort of a nerd who can be singly devoted to something I'm interested in." Konnyaku's soluble dietary fiber helps flush the intestines and assists in stopping overeating by sating the appetite, experts say. "It's a food that Beverly Hills cannot ignore," Endo said, hoping to further expand sales in the United States and perhaps even grow konjac there. "Freshness is everything for konnyaku. So why not grow them in the United States rather than export it? My dream to expand the popularity of konnyaku never ends," she said. "It actually goes with anything, soup, curry or yogurt, so it is a global food," she said.